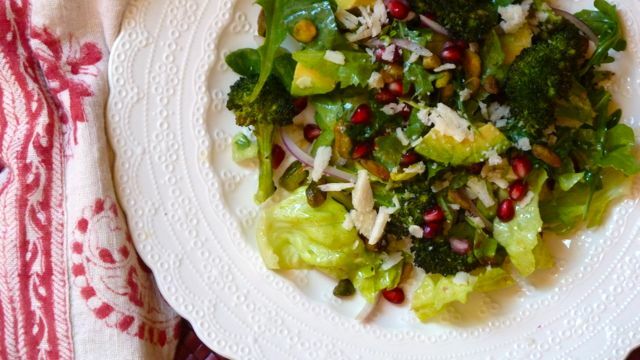 Escarole is a slightly bitter winter lettuce that partners well with other strong flavors—roasted broccoli, tangy pomegranate seeds and a mustardy vinaigrette, for starters. We’ve added lots of pistachio nuts for crunch and a touch of aged Parmesan for flourish. If you can’t find escarole substitute one of its cousins such as frisée or endive. Peppery arugula would be lovely as well. Cauliflower or Romanesco would be a nice addition if you don’t have broccoli on hand. The colors make this dish a natural choice for a winter holiday table. 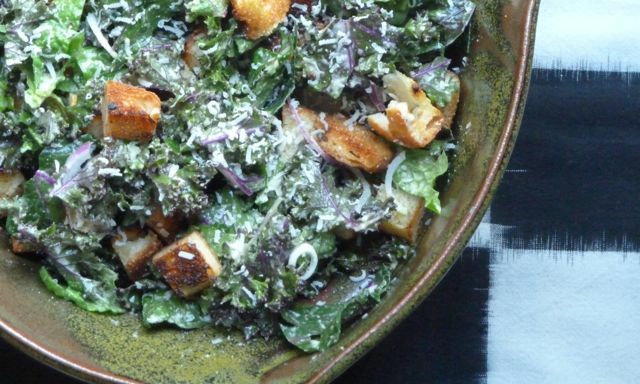 Raw kale is the perfect foil for garlic and lemon-laced Caesar dressing. The substantial leaves stand up to the thick, flavorful mix. I like to add some lettuce, too—to soften up the overall mouthful. You might add another green as well, perhaps a bit of spinach or arugula, or a few herbs. I developed the egg and anchovy-free dressing for my egg-avoiding, vegetarian husband. You’ll hardly miss either. 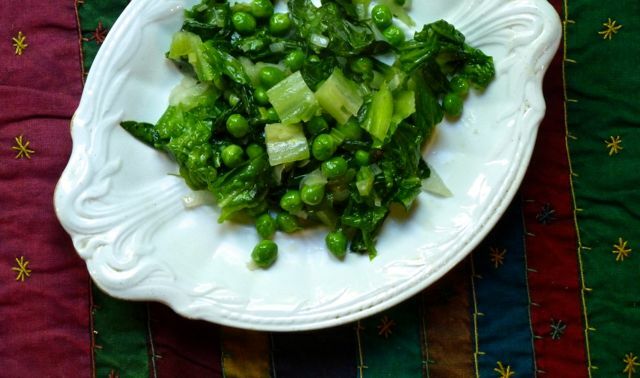 The dressing is thick, fragrant and packs a lemony punch. Just what you’d expect with Caesar. Try adding some ripe avocado to the bowl—it adds a pleasant creaminess to balance the crunch and chew.